Anya and I recently toured Taliesen West, the winter home, school and workshop of architect Frank Lloyd Wright. It induced me to think a lot about space and spaces. There’s an unusual Chicago connection. See “Space – Inside and Out” below. On April 6, at a well-attended presentation by Riverview Readers, I was interviewed by Jan Arkills and spoke about art and illustration, writing, engineering and other activities over the years. My thanks for the widespread interest by Riverview residents and the many novels sold during the hour. Below, as usual, is “Wisdom with a Smile”, this time with a quote from Scott Barry Kaufman, whom you’ve met before, and a joke about an aging artist (nothing personal, of course). I hope you enjoy my blog. Please take time to comment, about the website, the blog, or other topic. (Be sure to tell me who it’s from.) 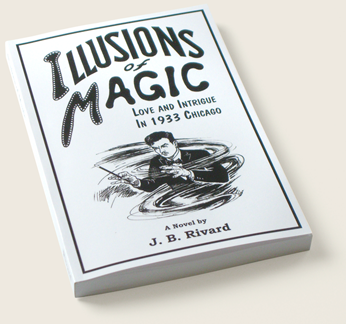 Simply send an email to: feedback@illusionsofmagic.com. Having recently toured Frank Lloyd Wright’s Taliesen West in Arizona, I felt a renewed interest in architecture and more specifically, the creative utilization of space. Certainly the historic landmark nestled in the foothills of the McDowell Mountains inspires consideration of the imaginative use of walls, floors and ceilings, as well as openings in these enclosures. This winter home of the Wrights from 1937-59 is really a collection of inventive spaces connected by terraces, gardens and pools, featuring exposed, massive desert stones mortared together with concrete. The buildings were constructed over a period of many years, during which they also functioned both as home and school for Wright apprentices, together with the necessary workshops. 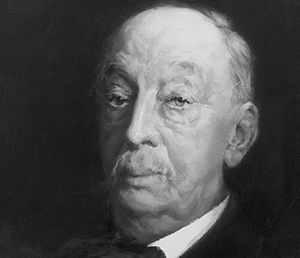 One of Wright’s antecedent innovators was William Le Baron Jenney (1832-1907), shown here. He was a founder of the Chicago School of skyscraper architecture, the first to use an interior iron or steel frame as structure, rather than relying upon exterior masonry walls to support the upper floors of a building—thus earning the title “father of the skyscraper.” He had learned some of the techniques of iron construction during studies at the Ecole Centrale des Arts et Manufactures in Paris alongside classmate Gustave Eiffel (of Eiffel Tower fame). Also helping Chicago become the home of the skyscraper was the mid-1880s development of the so-called safety elevator by Elisha Otis, who utilized the recent availability of powerful electric motors to move people and materials vertically inside these increasingly taller buildings. One of Jenney’s achievements was the First Leiter Building (1879), almost a glass box—ala the Bauhaus idiom—featuring iron columns and exterior masonry piers. He later designed the Manhattan, the first 16-story skeleton-frame office building. His Home Insurance building (1885) used the most advanced technologies of the time, a metal skeleton of iron columns, beams, girders and floor joists, all wrapped in masonry. 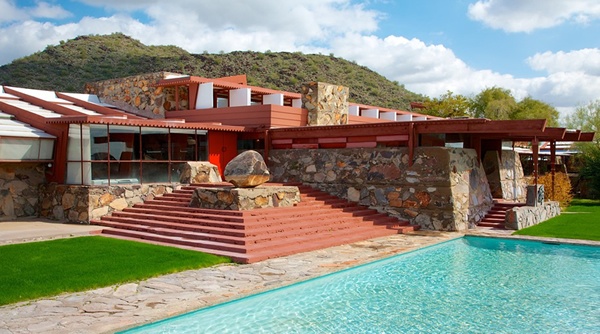 Jenney’s home designs included the James H. Bowen house in Hyde Park which offered free and open ground plans and fluid interior spaces that were forerunners of the creative spaces seen at Taliesen West. Thus Jenney, in addition to developing the modern skyscraper in the city of skyscrapers, was the creator of interesting spaces that predated the Prairie School style of Frank Lloyd Wright. I find the way in which these two creators of the past looked anew at the opportunities to partition and allocate space, then took these in unexpected directions, to be very inspiring. I hope readers find inspiration there as well. During my teens, I lived with my parents in Mishawaka, Indiana. Our home was only a few blocks from the New York Central main railroad line between New York and Chicago. Early each weekday morning, the 20th Century Limited passenger train roared by on those tracks, westbound for Chicago. And each weekday evening near suppertime, the eastbound Century roared by, heading to New York City. Naturally, I grew to love the hiss, the roar, the whoosh and whistle of the Century’s steam locomotives—until they were replaced by the groan and dissonance of diesels’ horns. Even as a child, I often spent parts of the summer at my grandparent’s in Hammond, Indiana, a short distance outside Chicago. Because Chicago is a giant rail hub, I got used to the sound of dozens of high-pitched train whistles that dominated the day and night noises at their house. Of course these sounds too were later displaced by the screech of diesel horns. Now, living in Spokane, I’m comforted by Burlington Northern’s through freights as they rumble by every half hour or so on the tracks across the river, sounding their mournful wail. However, during the past dozen years and more, I’ve been a “snowbird,” spending winters in Arizona, far removed from the home in Spokane. Alas, where I live in Mesa, Arizona, there are no nearby tracks, no trains at all! Bound for Dallas or L.A.
Paul Cezanne’s paintings are fascinating. At least part of the fascination is the enigmatic way he organized the elements of each, considered apart from line, color, and composition. This is not easy to explain, but may become clearer in the context of a specific work such as “Man with Crossed Arms” (1899), one of my favorite paintings. This portrait is a mature oil painting from the last decade of the artist’s life. Despite the predominance of blues, blacks and grays in a low key, the shapes and colors in this painting are marvelously conceived and executed. The painting is, however, unevenly finished. The sitter’s trousers and parts of the coat on the lower left are very lightly (hurriedly?) painted over the preliminary sketch, as though Cezanne was mostly concerned with the head and upper torso, where the warm tones of the face and the loose hatchings of the overcoat contrast so vividly with the dark hair, the dark tones of the underjacket and the background. The sitter’s left hand was apparently rendered larger at a prior stage of painting—the artist chose to reduce it using strokes of blue paint and black paint around the edges. Everywhere there is evidence of Cezanne’s intent to paint sculptural volumes in a manner suggesting volumetric weight: the repeated hatchings of boundaries with dark blues and blacks, stating and restating each outline as if to draw attention by repetition; the slashes and hatchings of paint brushed nervously into underlying patches of paint conveying a continuing effort to attain a firm three-dimensionality. These rough and repeated patterns combine to produce an almost excruciatingly solid conception. Without a doubt the artist’s conception exhibits exaggerations, distortions and/or displacements. For example, the sitter’s torso is unusually long, almost four ‘heads’ in length, compared with the average anatomical dimension of about three heads. The most obvious displacement, however, is the way in which the sitter’s face is depicted. The eyes and nose of the face are shifted, relative to the remainder of the face. This is most easily detected by noting how the nose falls to the left of the center of the mouth. To further analyze this curious displacement, I traced the image of the face as it appears in the painting (the drawing on the left). 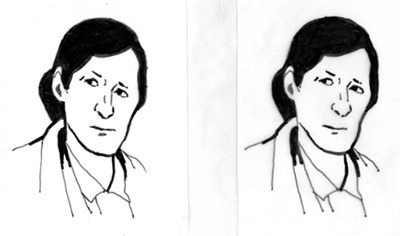 Then, without changing the interrelationship of the eyes and nose, I shifted them slightly in a second tracing (the drawing on the right). Notice how the right hand tracing, although portraying a more ‘regularized’ alignment of features, lacks the personality and invention of the painting. 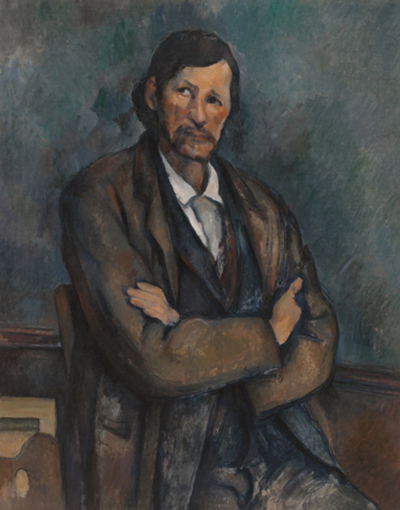 Cezanne’s shift of the eyes and nose conveys an attitude of resignation. What is most startling, however, is the way his portrayal (our perception?) of this displacement conveys motion, as though the sitter’s attention had been suddenly engaged by an event above and to our left! These several enigmatic features combine to yield a fully-realized concept that warrants continued study. The apparent shift of the sitter’s facial elements is only one of the many features of this painting that exhibits not only the mysteries of aesthetic accomplishment, but the enduring mysteries of perception as well. Have you noticed? Movies ain’t what they used to be. What? you say, with a new “Star Wars” installment due soon, a re-do of “Spider-Man,” “Wonder Woman,”“Justice League,”“Blade Runner 2049,”plus sequels of “Guardians of the Galaxy,”“Fast and the Furious,”“Planet of the Apes,”“Transformers,” etc.? Yes, the Hollywood tentpole is in business as usual. “Fast and the Furious,” which originally was an unrecognized title, went on to spawn numerous sequels. So did “Pirates of the Caribbean.” Same for “Transformers,” based on manufacturer Hasbro’s toys. These movies are not just successful, they are franchises. They are brand-names featuring toys, superheroes and comic-book characters with computer-generated imagery (CGI). They are youth-friendly, globally recognized and globally marketed. They are the successful products of Hollywood’s corporate culture. According to David Gritten in 2014, “Hollywood will be churning out a predictable series of dull, monotonous, special effects-heavy, dramatically incoherent movies for a relatively small segment of the cinema-going audience…” because “…blockbusters enable them to look Wall Street squarely in the eye.” Risk-taking is not for them. I personally prefer movies about people. Not just ‘ordinary’ people, but engaged people discovering new insights into life’s meaning and values, living stories that grasp and hold our interest and fascination without need of CGI. There is hope. Independent producers are floating small, effective movies—so-called tadpoles—movies made on microbudgets, from $100,000 to a few $million. How? High Definition (HD) digital shooting, in which there is no film in the camera, meaning there’s no printing cost. The ‘film’ is easily downloaded at the studio, at the editing site, or onto the director’s home computer. And most theaters are now equipped to project HD digital movies. I can’t wait. It’s possible that these smaller entrepreneurs, tadpoles swimming underneath the tentpoles, might just rescue Hollywood.